Sunific premium global anti-aging sunscreen is the first ultra-wide spectrum sun protection care that prevents and corrects all the signs of photoaging. With the patented Lierac filter system, ensures more complete anti-aging sun protection. Excellent daily use care with a sensory and pleasant aroma, with luminous and radiant finish! 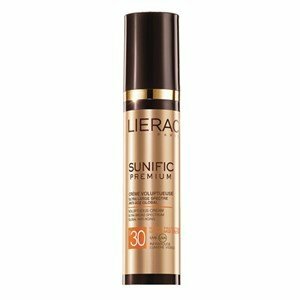 Lierac Premium Sunific confers a high SPF30 protection, against UVB, UVA rays, and also against infra-red and visible light. Apply on the face and décolleté before sun exposure. Renew the application whenever necessary, in particular, after swimming, sweating or dry with towel. Formulated with a patented anti-UVA and UVB system , Lierac's suncare, ensure an exemplary skin protection with anti-aging technology, which prevents the appearance of wrinkles, blemishes and skin relaxation. - Frangipani Flower Extract: anti-radical action. The solar care line from Lierac perfectly combine high efficiency with the pleasure of melting textures, non greasy, that leave no white residues, with a subtle and pleasant summer scent.